As a way to say thank you to our clients, all design services clients will receive one powder-coated 20oz Yeti® Rambler with our logo in white FREE - including delivery or shipping to you for the first design order. Our free Yeti® tumblers are available to design services clients only and not to our printing-services only or merchandise-service only clients. One free tumbler per client. Yeti® tumblers feature a double wall vacuum insulation that will keep your drinks cold for up to 24 hours or hot for up to 8 hours. These powder-coated tumblers are made of premium, kitchen grade 18/8 stainless steel with a dual wall design that is both puncture-proof and rust-resistant. The tumblers as well as their clear lids are dishwasher safe (but hand wash recommended to preserve the powder coating), shatter resistant, BPA free and feature a No Sweat™ Design to make sure your hands stay dry. 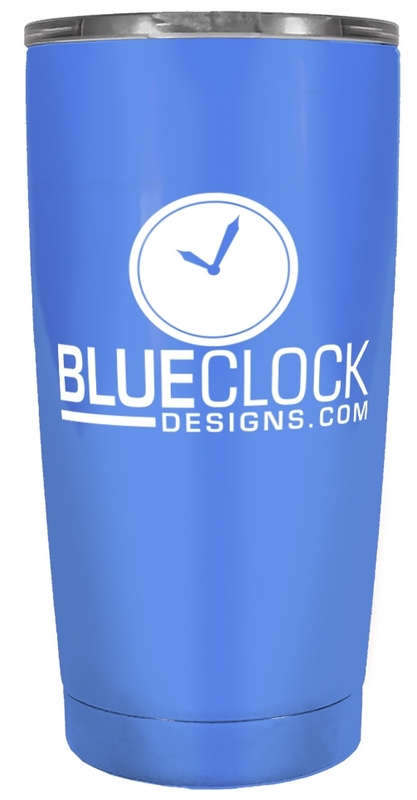 These powder-coated 20oz steel tumblers are available in Red, Metallic Green, Sea-foam Light Blue, Metallic Blue, Navy, Royal Blue, Light Blue, Steel, Purple, Hot Pink and Dark Pink. Please allow up to three weeks for delivery.